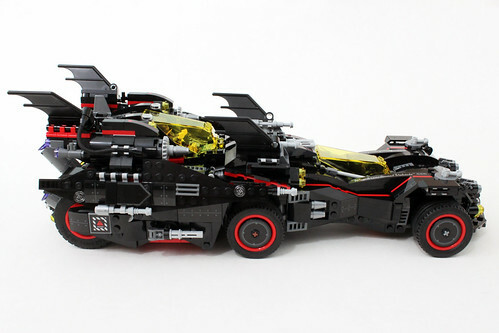 I’ve received the summer 2017 wave of The LEGO Batman Movie sets for review courtesy of LEGO and why not kick it off big with The Ultimate Batmobile (70917). 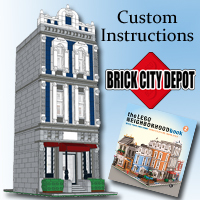 The set contains 1,456 pieces and will retail for $139.99. 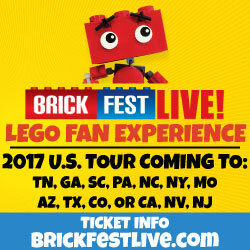 The official release date is June 1 but there are some store already stocking them. 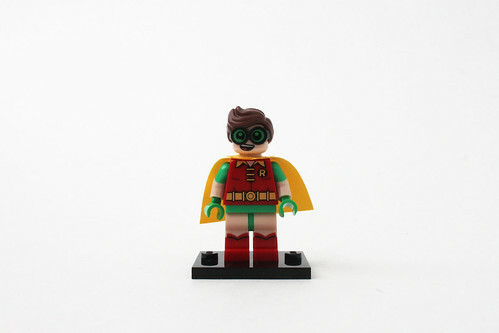 There are eight minifigures that are in this set, Batman, Robin, Batgirl, Alfred Pennyworth, Polka-Dot Man, Wicked Witch of the West and two Flying Monkeys. 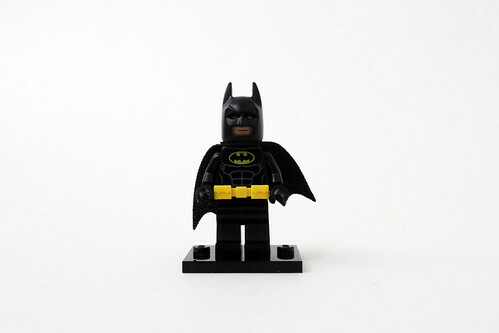 Batman returns in another set and most of him is the same minifigure that we’ve seen before. The only thing that looks new here is the head printing. He has a confident smile on one side and an unimpressed look on the other which I don’t believe we gotten before. 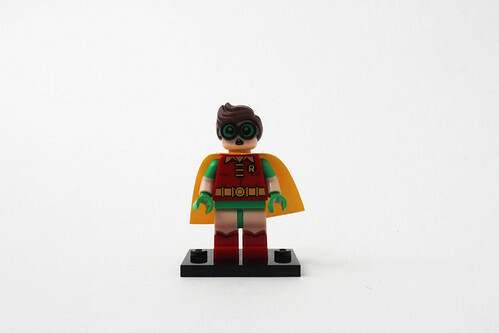 Robin is not exclusive to this set as the exact same version is also in the Catwoman Catcycle Chase (70902). 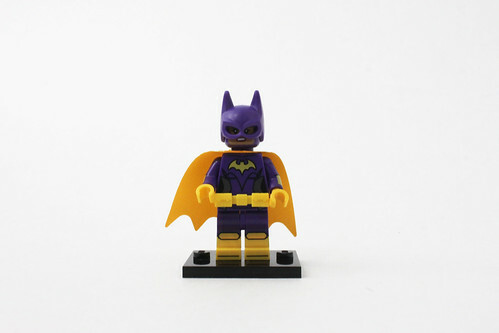 Batgirl is also not exclusive as she has appeared in a couple of sets from the previous wave. 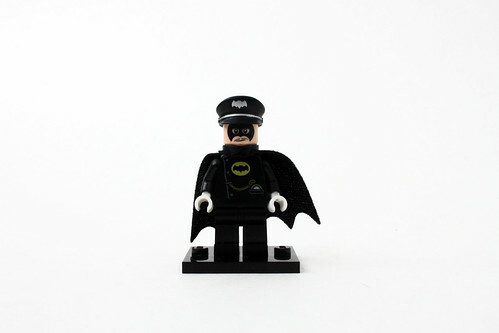 This version of Alfred Pennyworth is a new one as he is wearing a Batsuit. 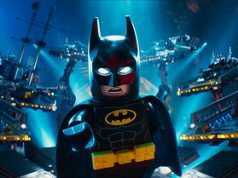 The Batsuit does not look like Batman’s but sort of a fancier outfit. 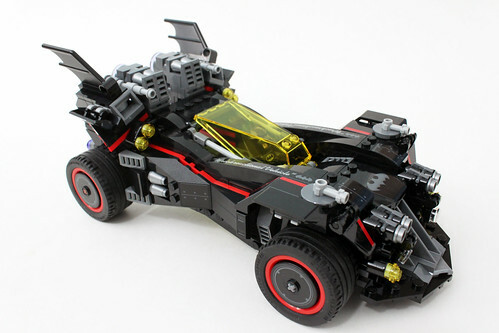 The symbol is the old-school version which is a nod to the original 1960’s Batman TV series. There’s also printing of a pocketwatch with a chain on the lower half of the torso. 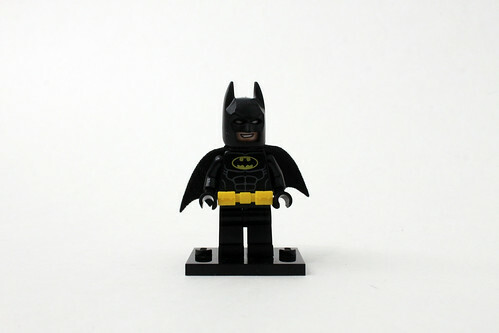 The head piece shows Alfred wearing a mask that covers the eyes. The hat mold is one we’ve seen before but there’s also printing of a silver Batman symbol as well as silver along the trim. Polka-Dot Man is a new villain that we get who was teased months before this set was announced. As his name states, there are different colored polka-dots throughout both sides of the torso and on the front and sides of the legs. The head printing is pretty neat as well. On one side, he has a goofy, bucktooth look and the other side shows him with an angry look. The helmet is the typical white motorcycle helmet but with more dots on the top. 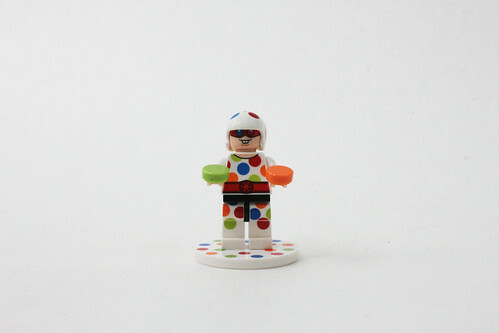 His accessories include a couple of colored 1×1 round tiles and the 4×4 round polka-dot flying disc. 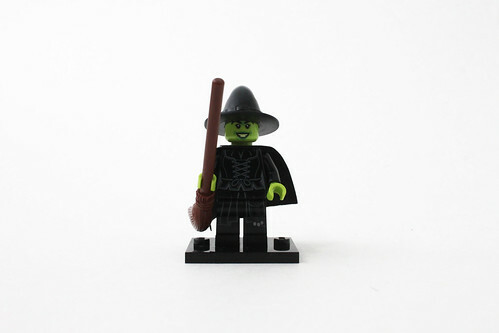 The Wicked Witch of the West also makes an appearance in The LEGO Batman Movie however the minifigure that we get in this set is not exclusive. Unfortunately, she is the exact same one that we get in the LEGO Dimensions Wizard of Oz (71221) Fun Pack down to the hat and broom accessories. Lastly, we have the Wicked Witch’s two Flying Monkeys. 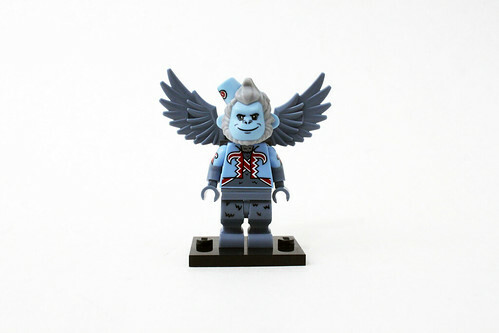 If you’ve played the Fun Pack, they were seen in the game but this is the first time that we’ve gotten actual minifigures of them. The torso has printing of their blue shirt with some red designs on the front and on the sleeves. The legs use the newer fawn legs. The head mold is really nice with the hair around the head and the fez on top. One monkey has an evil snarl while the other has a cunning smile. 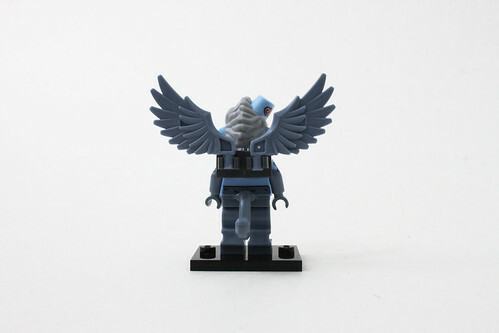 Between the head and torso is a clear bracket to hold the wings while the curved tail goes between the torso and legs. 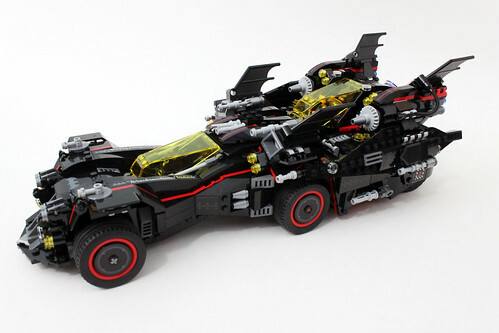 The Ultimate Batmobile is actually made up of four separate vehicles, the Batcycle, Batmobile, Bat-Tank, and Batwing. 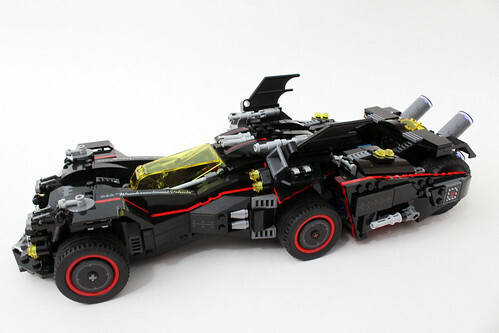 Before we get to the individual builds, we also have a fairly large Bat-Signal. 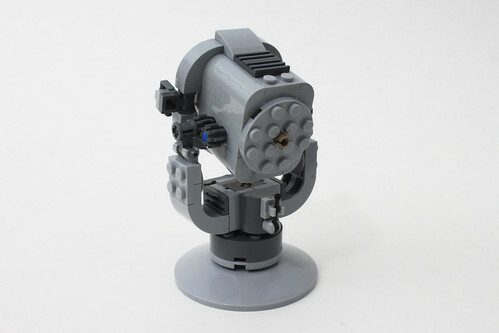 There’s a similar style as other TLBM Bat-Signals but in a larger scale. 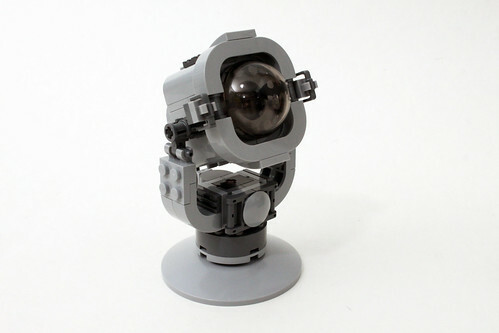 It is able to rotate a full 360 degrees while being able to adjust vertically as well. 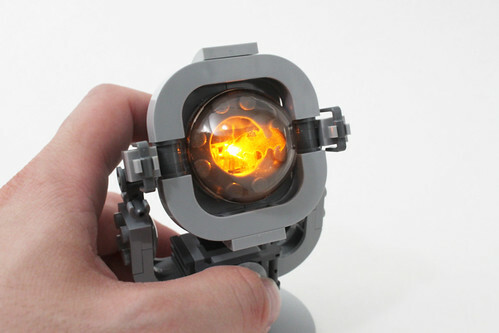 What’s cool about this signal is that LEGO has included an orange light brick to project the Bat symbol. 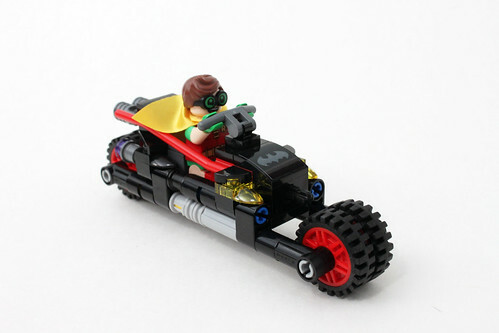 The Batcycle is the smallest vehicle is this set. 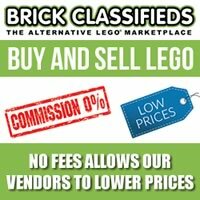 It’s a simple build but there are some nice pieces included with it such as the red harness and trans-yellow tooth pieces. 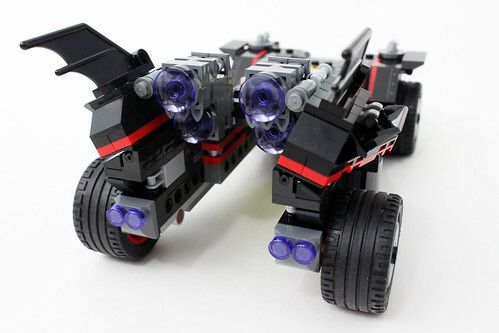 The wheels are able to open outwards to make it fly. 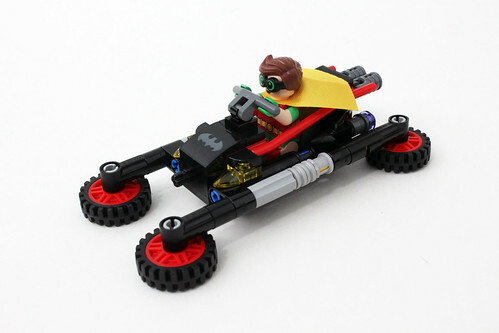 This also allows the Batcycle to fit inside the Batmobile later to make it combine along with the other vehicles. 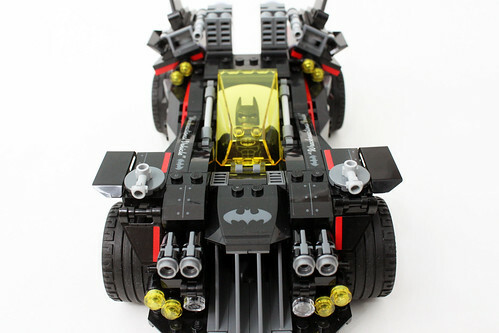 The Batmobile is the centerpiece to the Ultimate Batmobile and is the largest vehicle in the set. 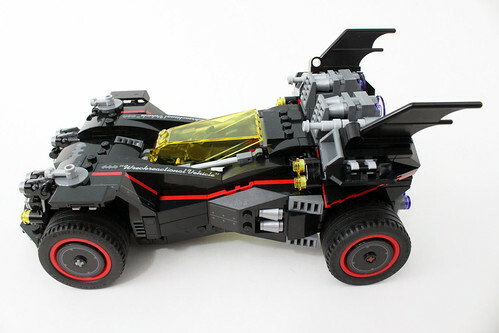 It has a different look than the other Batmobile (70905) due to its bulkier size but it is also shorter. In the front, there are fin pieces to represent the grill which honestly doesn’t look bad. Above that are some dual stud shooters on either side. There are also some lightsaber hilt pieces to represent some guns as well but they don’t shoot anything. 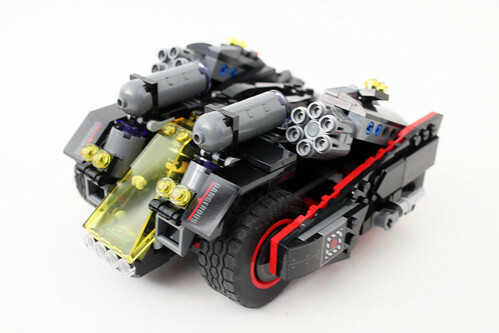 In the back, there’s a section for the thrusters which can be lifted up to conntect the Batcycle. 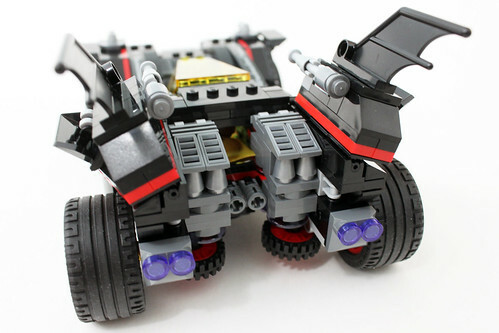 More detailing can be seen on the rear wings which can fold up and at an angle. The cockpit area is pretty bland as there is nothing inside besides the steering wheel. I do like the reverse windshield style of build as it gives a cooler look than the standard front-facing windshield. 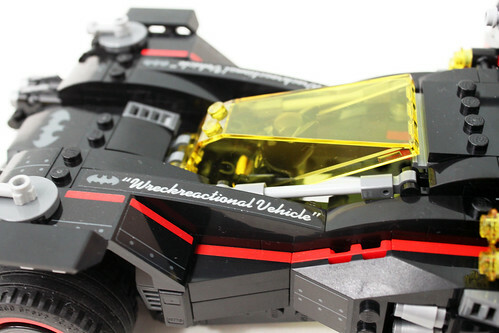 There are quite a few stickers throughout the Batmobile to give more detailing including the ones on the rims as well as the long ones next to the windshield stating “Wreckreactional Vehicle.” The Batcycle slides in from the back and attaches on with a Technic pin. 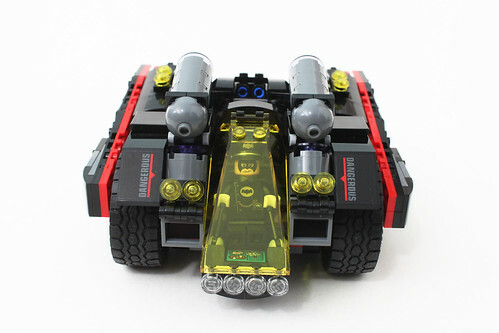 Next up is Alfred’s Bat-Tank which kind of reminds me of a shorter version of the M577 Armored Personnel Carrier from Aliens. The front of it has the windshield with a stickered console tile piece. 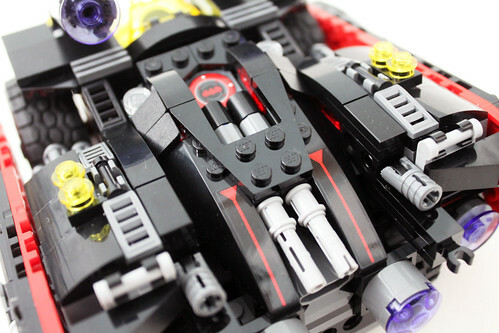 There are some thrusters on either side of the windshield that fold up with some large non-shooting cannons behind them as well. 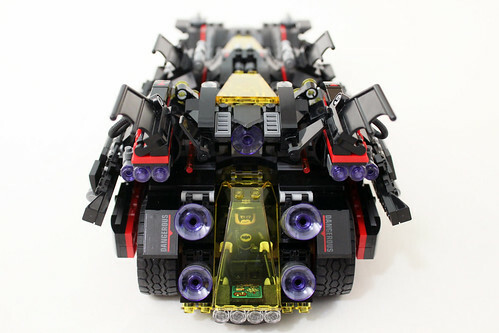 The center area of the Bat-Tank opens up to reveal some more sticker consoles as well as an armory. 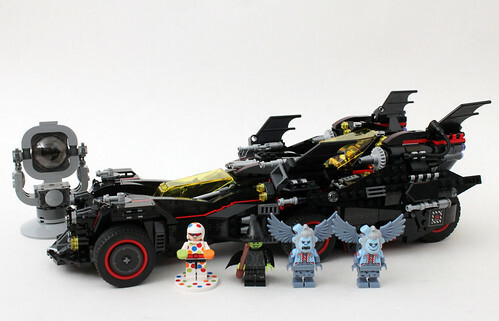 Some of the weapons that are held in this area include Batman and Batgirl’s Batarangs and Alfred’s two swords. On either side of the armory are some six-stud gatling shooter which can be lowered to be hidden. 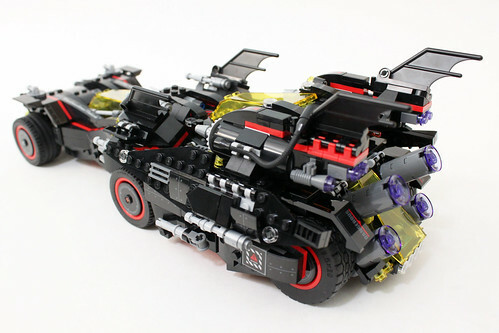 Finally, there’s the armory hatch in the middle which acts as a cover as well as a connection point to the Batmobile. 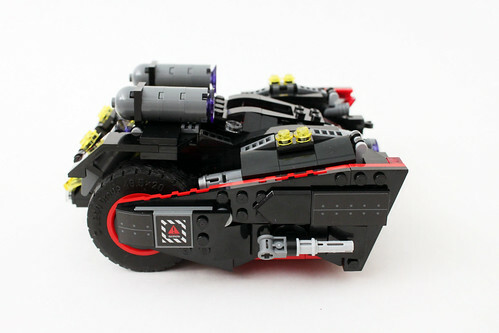 The Bat-Tank attaches at the rear of the Batmobile, reversing back in, by the way of some clips. 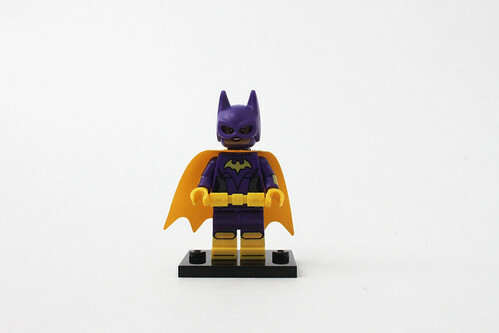 Finally, we have Batgirl’s Batwing. 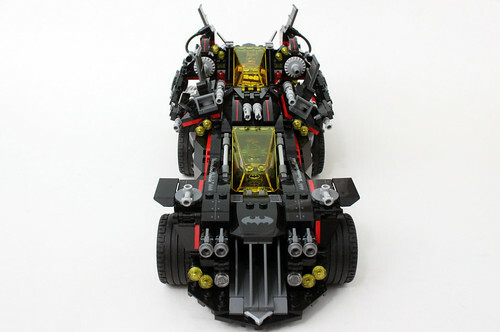 Like with the rest of the other vehicles, it has a different style to what we’re used to seeing as it has to conform to the overall build of The Ultimate Batmobile. 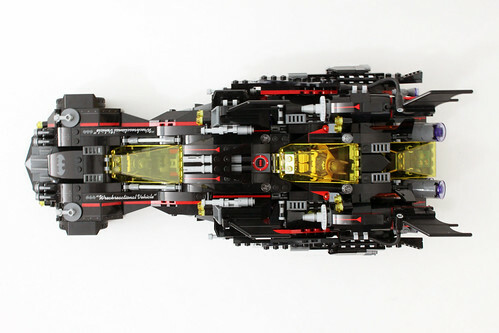 It’s a sleek looking ship that actually looks great by itself. 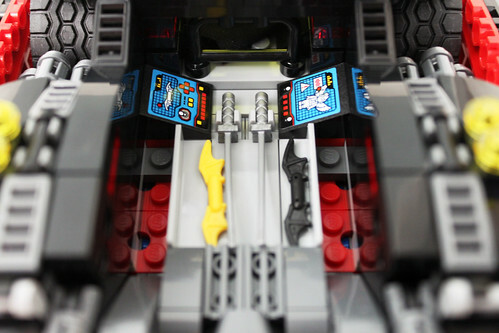 The windshield again uses the reverse style and the cockpit has some controls along with another printed console. 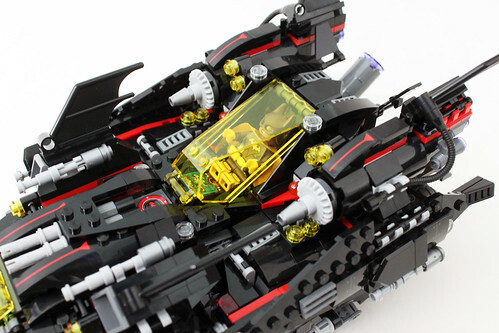 The rear fin sections attach to the turbines but just pushing the round 2×2 bricks to the back of the holes inside the turbines. 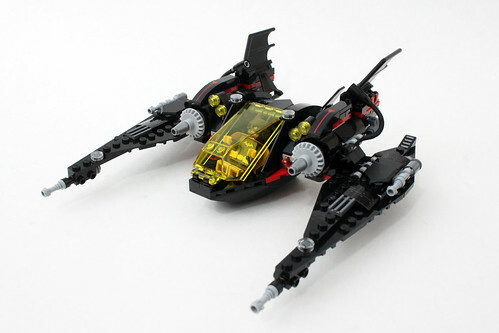 The outer wings are able to be angled in any direction but still looks cool nevertheless. 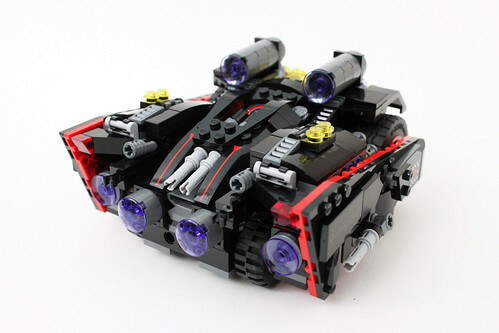 The Bat-Wing attaches to the Bat-Tank by sitting on top of the uncovered armory area. 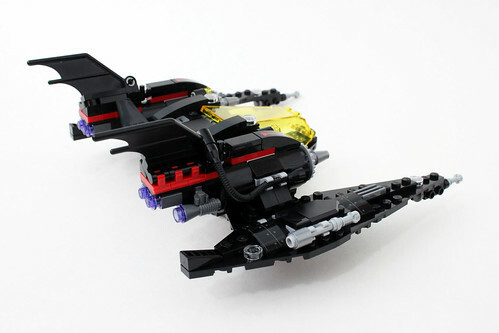 The outer wings fold down to give it more stability. 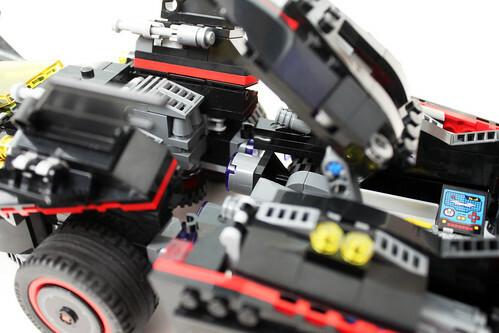 Like I said before on my preview post on Instagram, The LEGO Batman Movie The Ultimate Batmobile (70917) is by far the most fun set I’ve built for the theme so far. 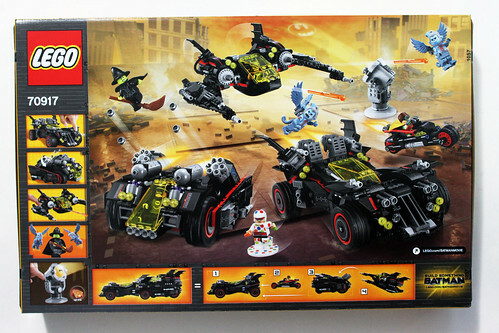 Each of the individual builds, besides the Batcycle, could be a standalone set themselves if LEGO wanted to but I’m happy they included all of them in one large play set. I’m a sucker for combiner things and I did get a good feeling after combining everything together. 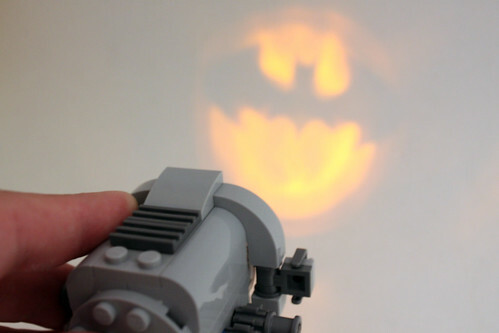 The Bat-Signal with the light brick was a nice surprice since LEGO didn’t even have to include it with this set and I would have still been good with it. 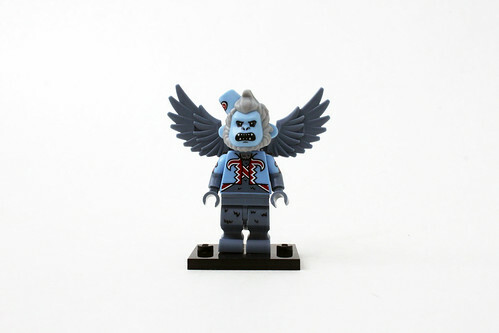 The minifigure selection is decent with some of the new characters like Alfred, Polka-Dot Man, and the two Flying Monkeys but some the repeats from the previous wave were somewhat disappointing. There are also some things that I felt could have been improved upon as well. 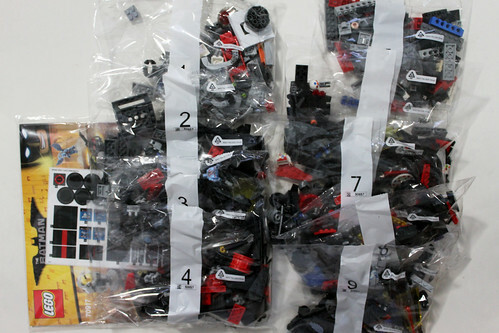 One thing is the abundance of stickers that are on the builds. 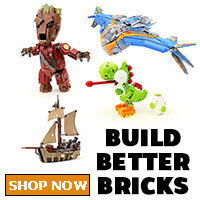 They aren’t necessary as the builds would still look good without them but they do add lots more detail. 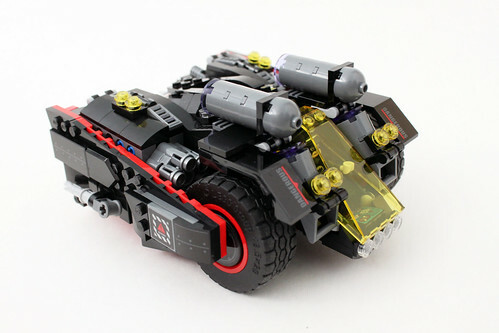 Another issue I have with The Ultimate Batmobile is that it is somewhat fragile, especially the connection from the Batmobile to the Bat-Tank. Since it goes together with only two clips, it might break apart if played with roughly. I’ve had it happen a few times while taking photographs. It was easy to put back but a few more clips would have been nice to keep it more stable. 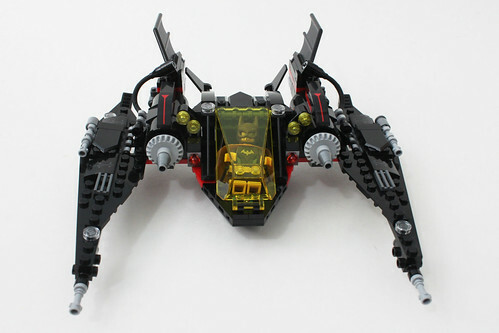 Lastly, there’s one minor issue is with the Batwing. 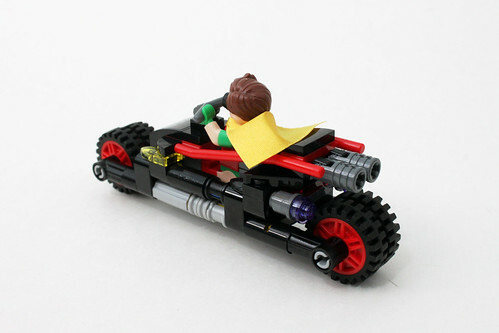 There’s no actual studded seat for Batgirl so she just slides around in the cockpit. If you’re trying to pose her with the controls in her hand, there may be some difficulty, especially when you close the windshield. 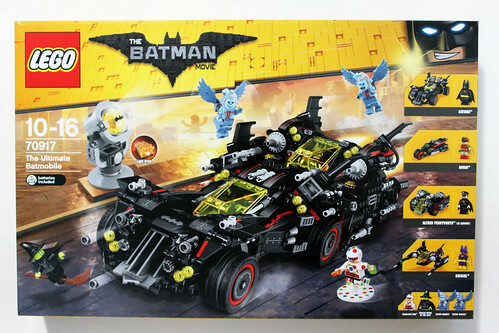 Again, The Ultimate Batmobile (70917) will be available starting on June 1 but some Toys R Us stores are already stocking them so if you want to get your hands on this very fun play set, you can check if they have it or not.